I closed my Discover account yesterday due to fraudulent activity. I’m waiting on a new card with a new account number and I cut up the old one. Once I get my new card, I’ll also be changing the username and password to access that account online. This isn’t my first experience with credit card fraud. I’ve had both a Diners Club and an American Express account compromised in the past. Those were corporate credit cards and the fraudulent activity was pretty standard: odd charges showing up on the statements. It’s pretty easy to spot fraud when your account shows evidence of a shopping spree in Virginia while you’re at home in Chicago. But this recent fraud I encountered was something completely new to me. My first clue that something odd was going on happened earlier in the week when I opened a piece of mail and found a new Visa debit card inside, waiting to be activated. All the material inside was in Spanish, a language that I don’t read or write competently. However, it was clearly a valid card and not one of those fake plastic or cardboard cards that are sometimes sent with credit card applications. I was very suspicious of the mailing and carefully looked it over trying to find a phone number for customer service that I could call to ask why I had received it. I spotted a website in small print at the bottom of the mailer, so I visited it (the site was all in English, at least) and found a customer service number there. The number matched the one on the activation sticker, and since it was the only option I reluctantly called it. After calling the number I was given two choices: activating an account or reporting a card as lost or stolen. I wasn’t able to get an agent on the line by waiting or pressing 0, so I eventually chose the option to report a card as lost or stolen. The customer service agent who answered said she couldn’t help me unless I gave her the account number, but I declined because I thought that would activate the card. At this point I thought that I was encountering a sort of mail phishing scheme where I would be on the hook for all sorts of account maintenance fees if I activated the card. I was incensed at what seemed like a dirty, under-handed way to get money out of less financially savvy people or lead to a blemish on their credit report. I actually visited the Illinois Attorney General’s website and downloaded a form so I could file a report to alert them to this scam. 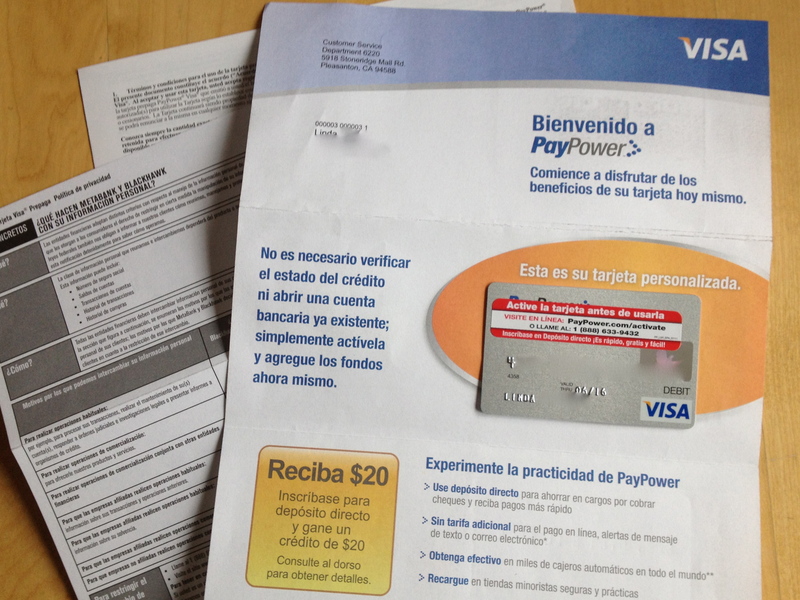 The mailer with the Visa debit card that seemed so suspicious. But yesterday as I sat down to pay my monthly bills online, I looked over my Discover card statement online and saw something very odd. I had $100 missing from my cashback bonus award. I looked up the redemption history, and found a $100 cash deposit to a company called MetaBank on January 14, 2013. That’s when it fell into place: I had seen MetaBank listed in the materials that came with the Visa debit card received in the mail. I’m still trying to figure out how my account was compromised, and likely I’ll never know for sure. After calling Discover, the fraud protection department asked me if I my online account information could have been used by anyone else. I told the agent that I only access my account from two computers: my personal laptop at home, and my work laptop which is always in my possession. (In fact, I’m obligated by my employer to carry the laptop between home and office.) I also don’t have my login or password information for any of my financial accounts automatically saved in my browser settings. Discover’s fraud detection department did tell me that they saw some suspicious activity on my account on January 11, 2013, just one business day before the redemption from my cashback bonus account to Metabank. A charge for $5 had been made to Rio Hotels, and then credited back to my account on the same day. Very suspicious, indeed. It didn’t show up in my statement at all, but the fraud protection department could see the activity. I hadn’t been visiting any hotel websites that day, although I had been visiting travel insurance sites to compare rates for a trip I’m taking this fall. I’d also made a purchase through Amazon.com using my Discover cashback bonus funds right around that time. Thankfully, Discover will refund my cashback bonus funds. While I use my Discover card for most purchases because I like their cashback bonus, I have other options for payment until my replacement card comes in the mail. And this entire experience has opened my eyes to a new type of fraud that I can be vigilant against. In addition to cutting up my card yesterday, I also cleaned the cookies and history from the two browsers I use on my home laptop (Firefox and Chrome) and started looking into software to detect viruses on Macs. (I’m not worried about my work laptop which is stringently protected by remote software monitoring and enterprise-level virus software.) I haven’t accessed my free credit reports at annualcreditreport.com in a while, either, so I’m going to make some time to visit at least one credit reporting agency today to see if there is any suspicious looking activity. I’d be interested to hear if anyone else has experienced something like this. Is theft of cash rewards common in the credit card world? If you have an account with cash rewards, do you monitor the rewards closely? If not, perhaps it’s time you started. My chickens are sick. When you’re keeping animals, sooner or later one will get sick or injured. So far, three of my six chickens are exhibiting symptoms of a respiratory infection. When I noticed the first hen shake her head and cough about a week ago, I dismissed it as her simply clearing her throat of the greens she had just gorged on. But my smallest hen, Jane, wasn’t shaking her head and coughing to clear her throat; that was the first real sign that something was very wrong. About this time I also noticed Jane was trying to sleep in a nest box at night. The chickens always hop up to their roosting bars at night. When I found Jane in the nest box, I nudged her along and she eventually joined her flock mates. Again, this should have been a clue to me. Last Sunday afternoon B and ran a bunch of errands getting groceries and so forth and returned home around dusk. Before we unloaded the car, I stepped over to the coop to shut the chickens up for the night. When I opened the door to the hen-house, I heard raspy, bubbly breathing from one of the hens sitting on a roosting bar. Uh, oh. But it wasn’t Jane that was breathing so roughly, it was one of the New Hampshire Red hens. (These three look so much alike I am severely challenged in telling who is who, so I really haven’t named them.) I knew I had to separate the hen from the flock immediately and isolate her. Respiratory diseases are highly contagious in birds and can have some serious consequences. I have two different places to keep chickens that need to be separated from the flock: one is in an Eglu coop/run in the backyard; the second is in my basement. I have a medium-sized dog crate that can hold two hens and provide them enough room to stretch and move around. Since it is winter and sick hens need to be given extra warmth, I had to bring the raspy hen into the basement. It actually took me two attempts to get the right hen. (As I said, the New Hampshire Reds look nearly identical!) Between the time that I left the coop to set up the basement isolation area and the time I returned the hens had moved around a bit on the roosting bars and I couldn’t figure out who was who. (It was also dark which didn’t help.) I grabbed what I thought was the correct hen, took her to the basement and popped her in the crate. Then I left her alone for a bit. A couple of trips in and out of the house resulted in two hens crankily squatting in the dog crate. They had food, water, and I covered the crate with a sheet and blanket to keep out drafts and block out any stray light. I checked them a couple more times before I went to bed, and had a moment of true panic when I spotted a splat of red on the bars of the crate, and another on the floor in front of it. “Oh no! The New Hampshire hen is coughing blood!,” I thought. As I was drifting off to sleep I realized that I had given the hens some leftover beets that day, and it was very likely the red spots were not blood, but a bit of beet remains still in her crop that she had coughed up. All night long I heard this hen cough loudly every hour or two. I was glad to see that she was still upright and OK the next morning, as was Jane. And the red stains were still there, exactly the same intensity as they had been Sunday night, so they definitely weren’t blood. (Which, of course, would have dried to a rusty red over night and not stayed vibrantly red as movies and crime shows suggest.) I was able to secure a morning appointment at the avian veterinarian and transported the hens there in the fancy carrier I usually use for them: a large cardboard box lined with newspaper. The vet was most worried about the New Hampshire Red hen; her breathing was worse than Jane’s, and she was retaining fluid in her abdomen, too. He said that he wanted to keep her in hospital for a day and give her two nebulizer treatments, and possibly a shot of Lasix. He thought it possible the fluid retention pointed to some cardiac complications brought on by the respiratory infection. Little Jane was in better shape and could be sent home with some oral antibiotics after she got a few shots. Right about here is where you, dear reader, may be asking, “Why are you taking chickens to a vet? !” Or perhaps you don’t ask that question exactly but wonder why I am treating chickens instead of just putting them down. Those are fair questions. I had this internal debate with myself as soon as I realized I had a sick hen or two. I came up with three possible approaches. Let the disease run it’s course through the flock unabated; the weakest ones would die, yet some are bound to survive. Immediately kill any bird that is clearly ill. Provide the same level of treatment and care that I would to a pet dog or cat that has a treatable illness. My main concern now is to get the sick birds well and continue to monitor the rest of the flock closely. I left the New Hampshire Red (hastily named “Bertha” for the sake of easier communication with the vet’s office) in hospital for the day, and that has stretched into two more. However, that’s my limit. Tomorrow I go to the vet’s office to bring her home or have her euthanized if it’s determined she likely won’t get better. Jane came home with me on Monday and is showing steady improvement. She’s eating, drinking, and her breathing is much less labored. Today she was even grooming herself, which is a very good sign. Unfortunately I had to pull yet another hen with bubbly breathing from the flock and isolate her in the crate with Jane. If I do bring Bertha home tomorrow I’ll need to move to my back up plan for arranging the basement isolation ward, since the crate is too small for three hens. There’s valuable learning in this episode for me and others in the Chicago chicken-keeping community, so I’ve been sharing my experiences on our message board. I asked the vet how my hens could have gotten this infection. I have a “closed flock” and haven’t added any new birds since last spring when Little Roo was rescued from the woods. I asked him if it was possible that the infection came from a wild bird or if the chickens could have been carrying the disease silently. Either of those scenarios are possibilities, and there are many more since these infections may also be carried on clothing, shoes, and equipment. I visit the coop often wearing the same shoes that I’ve worn walking around on errands, and the chickens are often allowed to roam the entire yard, getting in contact with all sorts of urban wildlife. Both are fairly scary as they are permanent; if a flock can be confirmed to have either of these diseases, they are considered carriers for life. It’s not tragic for me as I tend to keep flocks that are “all in and all out,” meaning I don’t add to the flock piecemeal and get rid of the old birds before I start with new birds all at once. But for someone who is breeding chickens, either of these diseases is devastating as they must cull (kill) *all* of their birds, disinfect the coops and equipment, and wait a few weeks before getting new birds. This is a sobering lesson to any chicken keepers. Be prepared to deal with a situation like this on all levels: have an area of your home or property that can used for isolating sick birds, and have the savings to pay the vet bills if you decide to use a vet. Some people choose to treat their birds on their own, but I’d prefer to leave that to an expert. I guess the one bright side to this is that I’ve learned how to pill a chicken and found it much easier than making a dog or cat take their meds.